Newly-published author/illustrator, Val Jones, tells us about the funny thing that happened on the way to HarperCollins. In 2010, I was forced to retire from my position in Data Management. I didn’t have the stomach to compete with fresh-faced, energetic graduates clambering for the precious few job openings…now what? My cousin Tina is a retired school teacher and loves children’s books. She started on-line writing courses and since I had freelanced when my daughters were small, I could be her illustrator (of course!). We joined Eastern PA’s chapter of SCBWI and signed up for the Fall Philly Fest. Tina wrote a story and painted a couple of illustrations. I also wrote my own story and created a dummy. We were ready for our contracts! At the Fall Philly Fest an author spoke about her submissions to publishers, while unraveling a roll of rejection letters that stretched from one side of the room to the other. But she was a YA author, nothing to do with me, (right?). I checked my watch. Only minutes to go until my first critique…I was about to be discovered! My ‘Mouse Potato Pie’ had no storyline, no pacing, no arch. Thanks to my corporate background, (where sharks eat their young), I listened carefully to my critique, thanked the Author/Illustrator, and calmly left the room before bursting into tears. 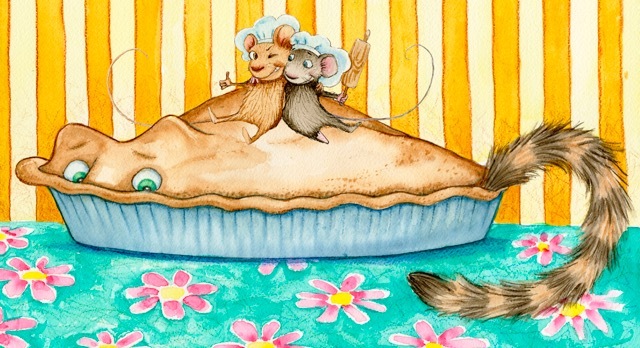 I recovered and re-wrote ‘Mouse Potato Pie‘, this time in rhyme (brilliant, right?). During that weekend, I was invited to join a wonderful critique group of ‘Illustrators Who Want to Write.’ Over the summer, I wrote ‘Pity the Kitty,’ ‘Fuzzy Legs Brown,’ ‘The Christmas Pony,’ ‘YAWN’ and ‘Here’s the Thing.’ As Tina’s interests turned away from writing, I began to research workshops I could apply to my ‘Master Plan’ to become an author/illustrator. In the fall, I qualified to attend the ‘Advanced Illustrators Workshop’ presented by Highlights in the spanking-new Barn and cabin facilities in Honesdale, PA. It was MIND-BLOWING! Days of hands-on workshops delivered by super-talented illustrators — even Caldecott winners! The first evening featured an illustrator’s exhibit. I gazed down the tables covered with stacks of published picture books by attendees – as I stood by my homemade Christmas cards and (huge) portrait of my dog, Fergus. Lindsey Barrett George was one of the presenters and she was (literally) stopped by Fergus’s oversized painting. She asked about my dog’s tail and suggested I write his story…”write what you know.” (What a concept!) 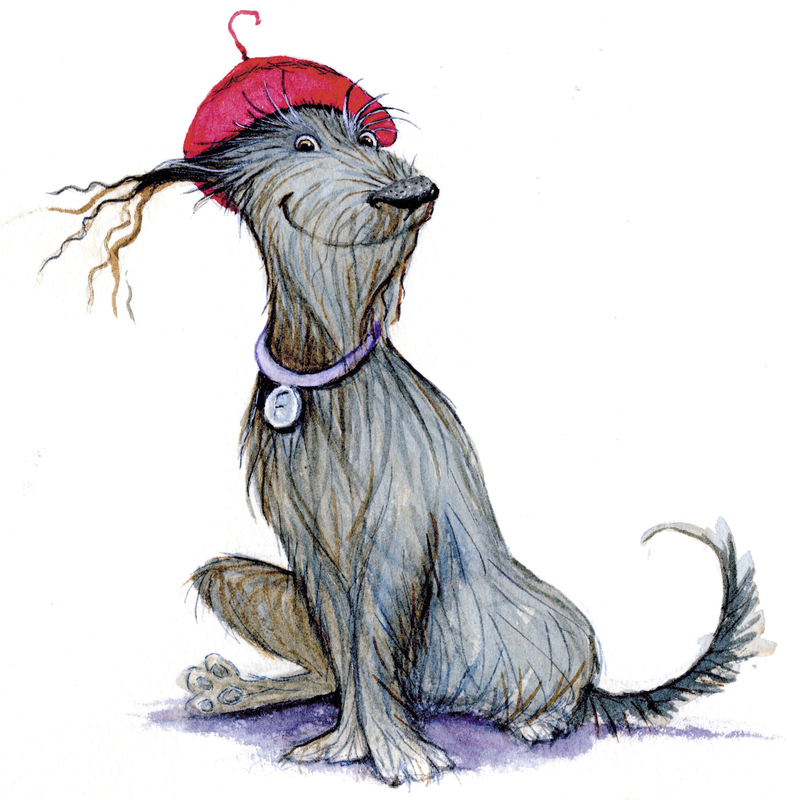 That evening I began to write a children’s version of Fergus’s adoption. The Agent’s partner gave my dummy a thumbs-down, but I was still encouraged. I emailed a ‘thank you’ to Bobbie Combs up at Highlights, who had set up my critique. To my astonishment, Bobbie replied that she liked my dummy and she knew an agent who might be a good match. (Agents should be good matches?) Bobbie offered to introduce me to this agent when the revisions to my dummy were complete. 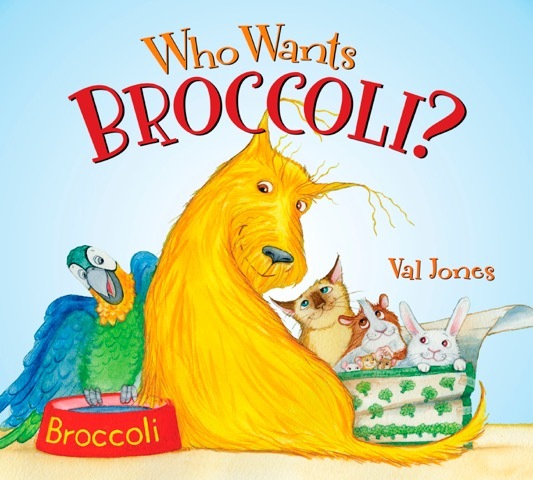 About a month later ‘Who Wants Broccoli?’ was ready and Bobbie introduced me to Karen Grencik of Red Fox Literary Agency. (Incredible!) Karen kindly replied that she was not taking new clients BUT she really liked Broccoli and graciously agreed to do an Agent Submission. I could not have asked for anything more. The Barn in Honesdale is the perfect retreat location. Cell phone service is nearly impossible, but I did have a wireless signal on my iPad. Late that Friday night after the editors event I opened my email and my heart almost stopped. My agent, Karen, had been trying to call me all day! …almost two years later, ‘Who Wants Broccoli?’ was released. Val Jones lives in Pennsylvania with her husband Bob, their dog Fergus, and Pity the Kitty. Please visit Val online or “like” her on Facebook. This giveaway is for a copy of Who Wants Broccoli? by Val Jones. Many thanks to HarperCollins for donating a copy for one reader. For a chance to win this copy of Who Wants Broccoli?, please leave a comment about this post by Tuesday, June 30th at 11:59 p.m. EDT. I’ll use a random number generator to pick the winners, whose names I will announce at the bottom of this post, by Wednesday, July 1st. If you are the winner of the book, I will email you with the subject line of TWO WRITING TEACHERS – Val Jones. Please respond to my e-mail with your mailing address within five days of receipt. A new winner will be chosen if a response isn’t received within five days of the giveaway announcement. Thanks to everyone who left a comment. And a special thank you to Val who stopped by to respond many times! What a great story! I love to share with my students the tireless work that goes into publishing books. I can’t wait to get this book on my shelf, The illustrations are beautiful. Congratulations to Val, I will keep an eye on whats to come. Thank you so much for sharing your process and long road to publication. I love sharing these types of stories with my 5th graders, especially those who write a draft and say, “I’m done!” They are usually shocked when I tell them about authors who spend years trying to get published! Fingers crossed that I win the book to share with them as I share your journey! Thank you for the detailed description of your book being published – what a journey, what a fabulous ending! Congratulations! So exciting! It sounds like yiu are someone with grit and tenacity. 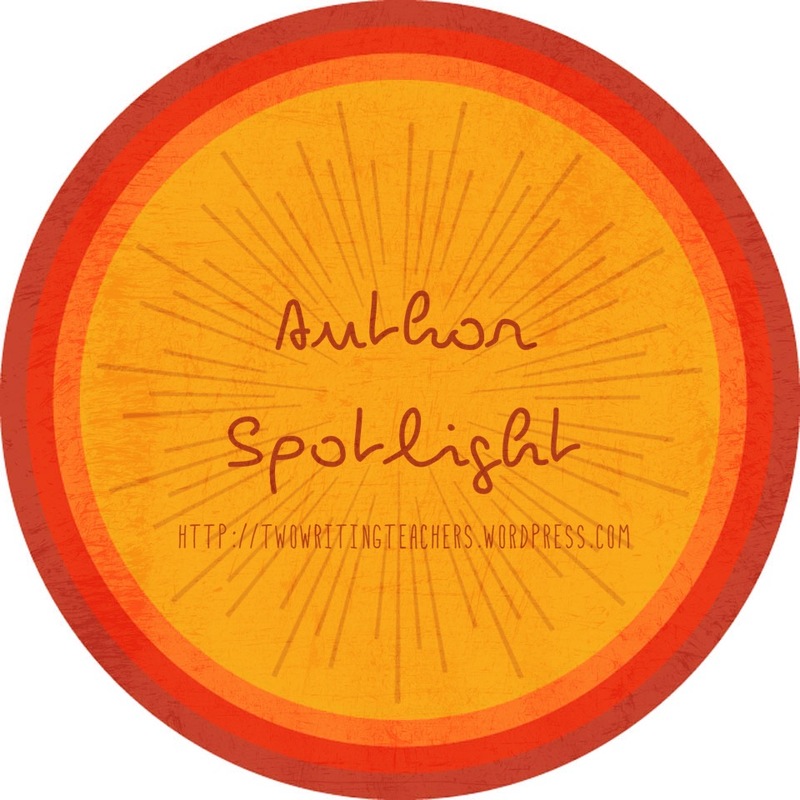 I am attending a conference this week where authors share their stories, and it has opened my eyes about the world of pitching, revising and marketing. This is a part of reading and writing that often ahppens behind closed doors. Thanks for sharing! Congrats! Thanks for sharing your journey with us. I was on pins and needles the entire time I was reading this. I love how you wrote your reactions in parentheses. Oh, we always think things will be easy and then we learn. What a good story to share with would be writers but also with students. We all need to learn and remember to hang in there – it is that big word perseverance that we all need to hold on to. Congrats on the new book! Thanks Christy – I can’t wait to share with the kiddies this coming school year…we talk about writing (what you know) then REREwriting 🙂 I had a practice session last fall with actual human children and it tickled me pink to hear the kiddies laugh and giggle in all of the right places! What a great example of perseverance! I always give examples to my students of authors who didn’t give up. It’s important that students understand that writing is not a “perfect the first time” journey. Your story will definitely be on my list of “Must Share” this upcoming school year. Who Wants Broccoli would be an awesome addition to our elementary school library! 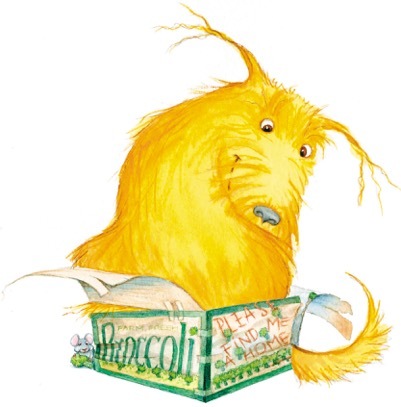 Broccoli would love it too – and I’d love to come by and read to the kiddos! I love your story! You’ve evolved in such a beautiful way. I love your tenacity and drive! You hit bumps, yet you never gave up! I wish you much success with your future endeavors. Terrie – your comment is above in eh058’s spot – my bad in getting the REPLY backwards!! Thanks for liking my critters…it’s so much fun to watch them appear on the page! Your journey gives new meaning to the new buzzword “grit.” I love your illustrations…so joyful! I replied to Patricia in error about Glenna’s comment about ‘grit’ – sorry! I love this! It’s great to hear how proactive you were when following your path. And great to hear how persistence paid off. Truly inspiring! I want Broccoli! 🙂 Thanks for sharing your journey. …and Broccoli is so good for you, too :))) I hope you get to enjoy him! What a great story! Writing is often something that happens to us by accident…but those are the best stories! It’s a sign…you must keep writing! Thanks for taking us along for the ride. What a fascinating process! Congratulations! Thank you – I even hand delivered my artwork to HarperCollins because I was so excited to be finished…apparently this is not ‘done’ – but I’d do it again! I love that you shared your story with us. This is really interesting. A whole different world. I was lucky enough to see an advance copy of Broccoli at Honesdale last fall and it was love at first sight! Congratulations, Val, and thanks for sharing your story. Looking forward to having you as one of our authors at the 2015 KSRA Conference in October! I am soooooooo excited to have been asked to attend this fall at the KSRA!! I LOVE talking to the kiddies and I’m getting braver at talking to grownups – this is such a wonderful opportunity…thank you Rose!! The folks at KSRA are lovely, Val. I’m sure they’ll adore you as much as Rose and I do. I read this in the interest of my sister in law who is trying to publish a children’s book. I’m just a blooming writer myself but unthinkable can both take away a lot from this article! Thanks for sharing. I’m so happy you found this helpful…there’s so much information and guidance out there telling you what you must do, and it’s so easy to get overwhelmed. 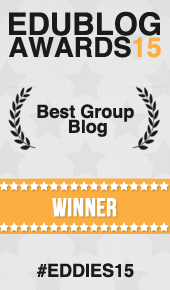 Four things worked for me; SCBWI, critique group, workshops and Agent – but that’s me and everyone has a different journey! That’s a long wait! I keep reading this from authors though, that they sell the books to agents/publishers but it’s years before they go to market. Such an interesting process! I just loved reading this! I think it is so important to share these stories with our students. They often see the finished book and don’t realize the perseverance that was needed to get that book published! Can’t wait to check out Val’s book!